If you want music to be a significant part of your college experience, you are eligible to audition for a Hesston College Music Scholarship. A successful audition will demonstrate your strong background, commitment to ongoing musical development and desire to be a leader. 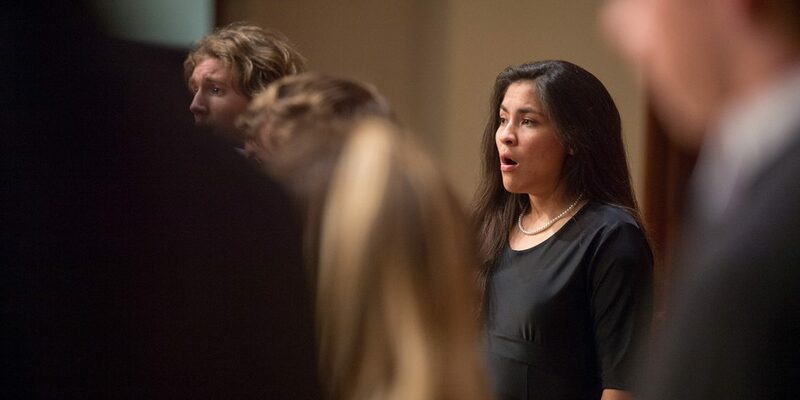 Music Scholarship Audition Days will give you a preview of music opportunities at Hesston College. Students can earn scholarships up to 65% of tuition. You will perform your musical selections for the Hesston College music faculty. Voice -Perform two memorized selections, one classical and one contrasting classical or musical theater selection. An accompanist will be provided. Piano, Organ, Classical Guitar -Perform one memorized selection of your choice. The work must be from the standard repertoire. Strings, Woodwind, Brass, Percussion -Perform two contrasting selections from the standard repertoire for your instrument. Memorization is not necessary. Audition days include the opportunity to interact with music faculty and students, attend classes and music ensemble rehearsals, and have a master lesson with an applied music instructor. Ask a teacher or mentor to complete this reference form within two weeks of your audition. Students who maintain at least a 2.75 grade point average and remain in good standing in the music program may renew their scholarships as sophomores. Approach the audition like a job interview. Put your best self forward. Over prepare. You will never look back and wish you had spent less effort preparing. Dress for success. Present yourself like you would in a formal recital. Be ready to talk about your musical goals. How can Hesston College help you attain these goals? We want to get to know you and know how to best serve you. Why should I come to Hesston College?